The Skinny Burger. Do you understand you’ve gone too far this time London? Is that where Moss and Brand and Gwyneth-sodding-Paltrow have led us? Make a skinny latte, fine. Even take jeans and make them less comfortable and more expensive and make them skinny – I’ll shop somewhere else. But the burger? No. That’s ours. So get your well paid, well presented, well-within-your-BMI-threshold hands off our burgers. In five years’ time we’ll all be ordering a skinny pint or skinny pie. Is that the future you want for your children? Healthy? Slim? Eating no more or no less than the guideline daily amount of carbohydrates? ‘Cos I sure a sh-ugar don’t want my offspring growing up in some Charlie Brooker-Atkins diet hybrid world. All the fingers will point to The Blue Posts. Bun-free. No chips. What’s the point? Who does this cater for? If you want to be healthy, don’t look at the burger section. There’s plenty of pastas, soups or incorrectly spelt ‘lite’ bites. If you’re even entertaining looking at the burger section for whatever reason (hunger, greed, apathy) then you’ve probably already decided you want something cheesy, saucy and ‘with bun, yes chips’. If you fancy some kind of meat with a bit of lettuce-type stuff, THAT’S A SHITTING SALAD! So the skinny burger doesn’t exist, because it ceases to be a burger in true form the second it becomes bun-free. Like the moment a butterfly bursts from the chrysalis it ceases to be a caterpillar; the moment a beef patty splodges from a soggy bun it ceases to be a burger. What you have there, my friend, is a meatball. And nobody in their right mind would order “Meatball and gherkin”. A bad salad, yes. But a salad nonetheless. But what does this tell us about the pub? I’m not sure. Venturing upstairs you will have to accept a more sterile atmosphere in exchange for a seat. Downstairs is a warm hubbub of a place, full of jokes and chat and brollies dripping on the stone floor. There are more lagers on offer than ales (an indicator of the clientele probably), but the general atmosphere is chipper. 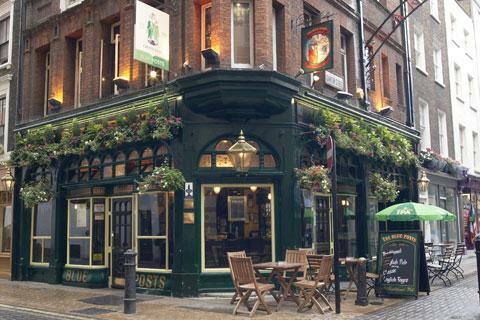 A convivial place for a post-work pint, but not a place for an evening of revelry. And certainly not a place to dine.